Okay, if I’m going to be perfectly frank? I had a hard time getting through Northanger Abbey. Catherine, while sweet, is a bit of a ninny. Obsessed with the novel, The Mysteries of Udolpho, and Mr. Tilney, she was concerned with very little of consequence beyond her imagination. “You have been abroad then?” said Henry, a little surprised. Now, nobody loves a good novel more than I. But, Jane Austen seems to poke fun of those who mock her very craft by saying they are silly things, then she goes ahead and creates a silly female character. I had no patience for Catherine. While it was endearing to read of her friendship with Eleanor, and her romance with Henry Tilney (“Friendship is certainly the finest balm for the pangs of disappointed love.”), it was annoying to endure her fantasies while staying at Northanger Abbey. Too reminiscent of Jane Eyre, in my opinion, is her pondering what the General has done with his dead wife. Perhaps, Catherine wonders, she is not dead at all; merely locked away and fed inglorious meals. As in most romance novels, everything works out perfectly in the end, but it was all too trite for me. In this round of Austen vs. Dickens? Most certainly Dickens has my vote. Or, perhaps, Ms. Radcliffe, once I’ve read The Mysteries of Udolpho. 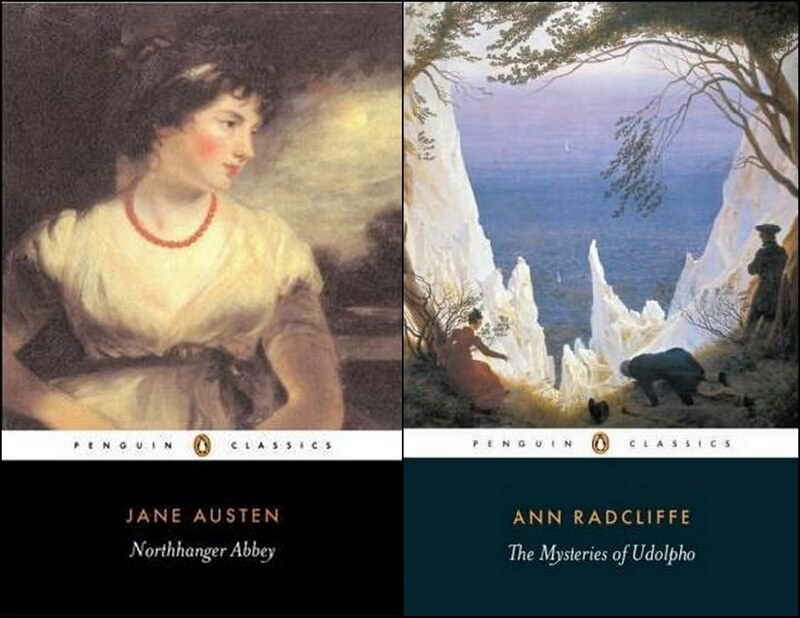 Find more reviews on Austen or Dickens this month at The Classics Circuit. Northanger Abbey is Jane Austen's parody of the Gothic Genre. Catherine Morland, as a parodied character, is supposed to be naive and suspicious, result of her crave for Gothic novels esp. Radcliffe's TMoU. Have you read Ian McEwan's Atonement? That book uses Henry Tilney's reprimand of CM as an epigraph at the beginning… a parallel of the young girl's wrongful suspicion that sparks the rest of the story. Although I agree with you that CM is not my favorite JA heroines among all her six novels. Arti, yes, I understand that Northanger Abbey is a parody of the gothic genre. Still, why? Aren't most young girls naive? Doesn't that go without saying? I read Atonement, and Briony is a girl I singularly despise. Combined with her so called innocence is a terribly manipulative personality, and I still cannot forgive her for it. Although it was not done to me, I felt every wound she inflicted as though it was personal.At least Catherine did not create destruction of the lives in her path. So I can like her a little better than Ian's Briony. Still, she bored me. How would the novel work if Catherine were less naive? What story would Austen tell?Or, the other way: How could we have a story about a character who swallows Gothicness whole, who drags Gothic nonsense into her ordinary actual life, if the character is also clear-headed, sensible, not at all impulsive, etc. ?Northanger Abbey is part of a long tradition, going back to Cervantes, at least, of novelists mocking novel-readers and the idea of novel-reading. Arti, true enough…every young girl pales in comparison to Briony! I'm in a very big minority here, as most people I know feel that Briony is innocent due to her youth. I don't buy that for a minute.Amateur Reader, it wouldn't work if Catherine were less naive; Austen wouldn't have a story to tell, or, at least not this one. And that, I think, would be fine. Who cares about all this 'Gothic nonsense'? I guess I want a novel to be an interesting story, or an inspiring hero/heroine, but I don't want to end up feeling that there was no point at all. In Pride and Prejudice at least we had a love story, as well as a ridiculous mother to scorn. Here, I wonder what I'm left holding. A dark cupboard in an empty room which is immediately obscured when the candle goes out…so? Why should I as the reader care? Catherine's whims are so irrelevant to mine that I found the novel pointless. I am thinking about the idea of mocking novel lovers, however. That bears a lot more weight than flighty girls. I've probably bored people with my dislike of Austen, and also am on the individuals not really English, because of my constant reiteration of my antagonism towards her & that Dickens chap, It's probably due to over exposure growing up. But It's there. I have not read this Austen, and this hasn't put it on the top of my list, needless to say. But your perspective is always appreciated! I actually do want to read The Mysteries of Udolpho. As for Northanger Abbey, I remember I liked it, but that's about it. Definitely time for a reread. Bellezza – that seems much clearer to me, that your problem is not with the heroine, but with the premise and all that flows from it. Northanger Abbey is a conceptual novel. The concept determines everything. The concept is the point.I'm not convinced that it's that great a concept, either! But the more interested readers are in how Gothic novels work, why they were (and are) so popular, what their readers do with what they read, the more likely they will find Austen's concept similarly interesting. I enjoyed Northanger Abbey, because the characters were drawn very broadly (good, bad, silly) but I wouldn't say it's Austen's best. That goes to Pride and Prejudice! Samstillreading, I agree with you that Pride and Prejudice is Austen's best. It seems to be her most enduring, and readers have such a connection to Darcy! I wanted to let you know that I picked up The Virginian–and I think it was *just* the right book for me at the moment. I found it very satisfying and wonderful. I haven't read Northanger Abbey, yet, but I was disappointed with the last Austen I picked up. I'm going blank on the title. I do want to read this, partly because I like gothic novels, but it amuses me how much Catherine obviously irritated you! I really enjoyed The Mysteries of Udolpho. If you're going to read it, wait until winter time when it's cold, gloomy, and overcast; or snowing. I don't think you can truly appreciate Northanger Abbey without first reading Mysteries of Udolpho. I laughed out loud in several places. The times Catherine acted on her fantasies were hilarious! She's a drama queen, for sure. I think that being married to Henry will mature her, and she'll settle down and make a good wife. She'll keep him interested because of her dramatic flair. Must be an enjoyable read Northanger Abbey by Jane Austen. loved the way you wrote it. I find your review very genuine and original, this book is going in by "to read" list.